Discover an elegant oasis poised atop a world-class air terminal where luxury, comfort & convenience create a premier destination. 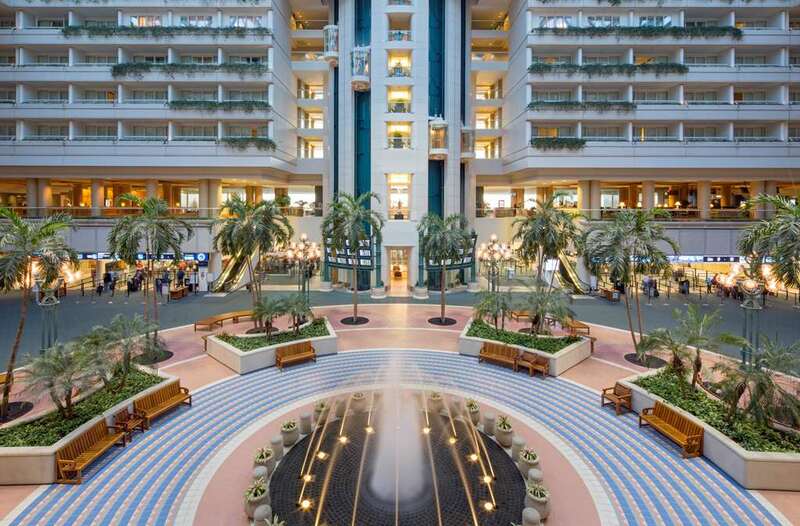 The Hyatt Regency Orlando International Airport is located inside the main terminal of Orlando International Airport. Only AAA 4 diamond hotel in Orlando airport corridor; 445 guest rooms, 23 luxury suites with 2 restaurants; Hemisphere; McCoy's Bar & Grill; 24 hour room service; 24 hour stay fit gym; outdoor swimming pool; save on first night and last night's car rental charges; Centrally situated and with easy access to major highways, and Orlando's most famous attractions. Hemisphere: Hemisphere Restaurant open for breakfast and dinner located on the 9th floor. Closed for dinner on Sundays. McCoy*s Bar Grill: Located on the 4th floor - McCoy*s Bar & Grill features wood burning pizza oven; American Cuisine. Lobby Bar: Nightly food and drink specials ensure that your visit is as affordable as it is enjoyable. Come on down. Have a seat and stay awhile. Open Monday - Friday 4:00p.m. - 12:30a.m. and Saturday - Sunday 11:00a.m. - 12:30a.m. Located inside Orlando International Airport; no need for shuttle transfers to and from the airport; just stroll to our front desk for immediate check in and relax in your guestroom within five minutes of your arrival; Centrally situated with easy access to major highways and Orlando's most famous attractions.